At 7:45 this morning, we see some activity on the radar, but with the lower levels of the atmosphere being really dry at the moment, nearly all of this is virga. 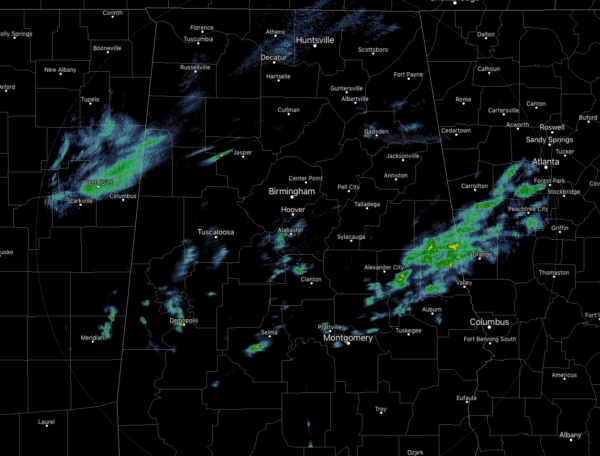 There may be a few of these that are reaching the surface with either very light rain or maybe a few sleet pellets. Temperatures at this time were in the upper 20s to the mid-40s across the area. Cullman and Haleyville were tied as the cold spots at 28 degrees, while Montgomery was at 45 degrees as the warm spot. After having a few sleet pellets and a few snow flurries fall over the northern parts of Central Alabama during the overnight and pre-dawn hours earlier this morning, your Saturday will be a mostly cloudy and a cool one. We may have some light sleet or light showers out there for a couple more hours, but those should diminish by late morning. Afternoon highs will top out in the upper 40s to the lower 60s across the area from northwest to southeast. Tonight will be cloudy and cold with a very small possibility of a few light showers over the northeastern quarter of the area. Lows will be down in the upper 30s to the lower 40s. On Sunday, we’ll have a high off the Virginia coast while our flow over Central Alabama will be out of the west-southwest. This will set up a wedge over the northeastern parts of the area. While much of the area should remain dry, we do have a small chance of light rain or drizzle over the north and northeastern parts early and slowly spreading southwestward into more of the central parts of the area. Rain chances will be highest north of US-280 and I-22, around 30-50%, while south of that will be decreasing as you move south, around 20% and less. Highs will be in the mid-40s to the upper 50s across the area from northeast to southwest. Those shower chances will continue for the late night and overnight hours with lows in the mid-40s to the lower 50s. Monday will be a much warmer day, but shower chances will increase throughout the day as a cold front will begin to approach the area. There will be a chance of showers early, but rain will become likely late. There may be just enough instability for a few claps of thunder during the late night and overnight hours, but at this point, organized severe weather is not expected. Highs will be in the mid-60s to the lower 70s from north to south. We see that the cold front will move through the area on Tuesday, pushing the rain eastward and out of the area by the afternoon. Rainfall totals could end up around 1.00 to 1.50 inches by the end of the event, with the heavier totals in the northwestern parts of the area. After the front moves through, cooler air starts to filter in behind it. Highs top out in the lower 60s to the lower 70s in the morning, but temperatures will be dropping throughout the day. Wednesday will be a really nice day with mostly sunny skies as high pressure will be moving across the northern parts of the area during the day. Afternoon highs will top out in the mid-50s to the lower 60s across the area from north to south. Another system starts to rapidly develop out to our west on Thursday, and that will bring us more rain and possibly some thunderstorms starting as early as Thursday afternoon. The main focus of the rain will move through during the late night and overnight hours. At this point, severe storms do not look likely, but we’ll keep our eye on it. Highs will be in the lower to mid-60s from north to south. The rain moves out of the area during the latter part of the day on Friday, but before it is over, we could see rainfall totals around 1.00 to 1.50 inches across the area in a 24-hour period from noon Thursday to noon Friday. Skies will begin to slowly clear after the rain moves out. Highs will be in the upper 50s to the upper 60s.